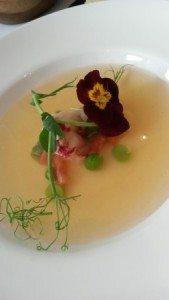 With it’s comfortable simple elegance, clean lines and attentive smart and attractive waiters, The Restaurant at Drakes is the perfect setting for a swish lunch, which is exactly what I did this week with my swish friend Christabel. The food is remarkably good and the wine on a par! We went down on Wednesday for an afternoon treat and will be going back very soon. They have got their customer service and menu variety down to a tee and the quality and beauty of the food is astounding. 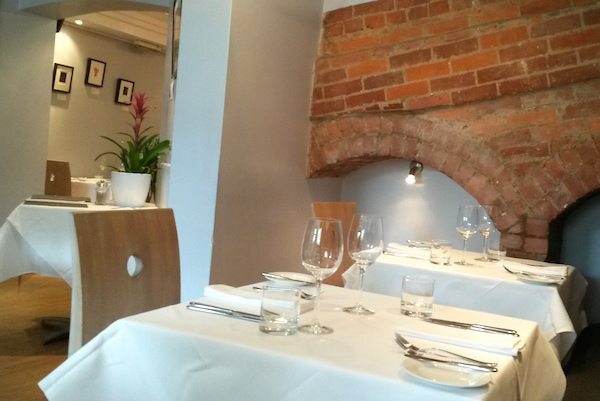 We started by choosing from the wine list, where there are an encouraging number of English and local wines, and then ordered our delicious lunch. 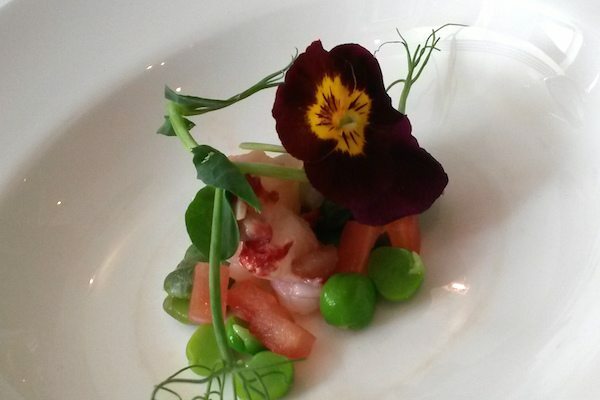 Before the starters arrived we were presented with a fresh and tangy appetiser – Tomato Consommé with poached lobster, broad beans, tomato and peashoot garnish all topped off with a beautiful edible flower. It was fresh, tangy and delicious, not to mention beautiful. A great start to a truly beautiful lunch. 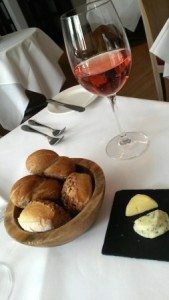 We were happily sipping our gorgeous chilled wine, Christabel had opted for the Sauvignon and I went for a Cambridgeshire Pinot Blush – both amazing, when the starters arrived. I had the Uig Lodge Smoked Salmon with Caper Salad. It was beautifully presented with razor thin finely sliced salmon which was so fresh it tasted of sea breeze on a cool day, which was perfectly complimented by the tart salty capers. A perfect pairing and just the right amount for a taste sensation before the main event. Christabel had gone for the Local Asparagus Soup topped off with a poached Bantam egg and crunch delicious asparagus. 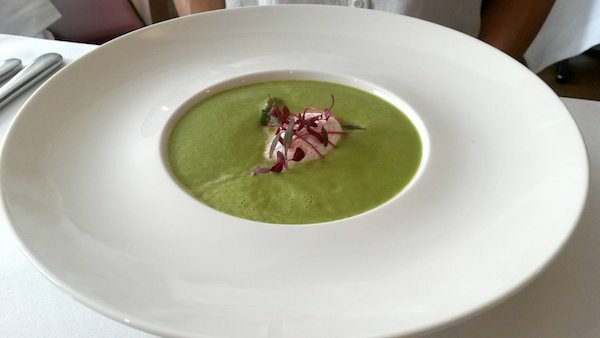 The soup was poured with flair by our gorgeous waiter, and was feather light but creamy in flavour, the asparagus crunchy and fresh and the Bantam egg poached to the most wonderful golden point of loveliness! It was perfectly seasoned and the crunch of the veg paired with the creamy light soup was incredible. The starters were light and delicious, but not too much to interfere with our appetites for the main course. An all too often occurrence when eating a 2 course lunch. My main course was amazing, and so perfectly cooked and presented I thought for a moment I was in an episode of Masterchef. I had the Rump of New Season Lamb, so tender and soft and pink it was almost obscene (!) 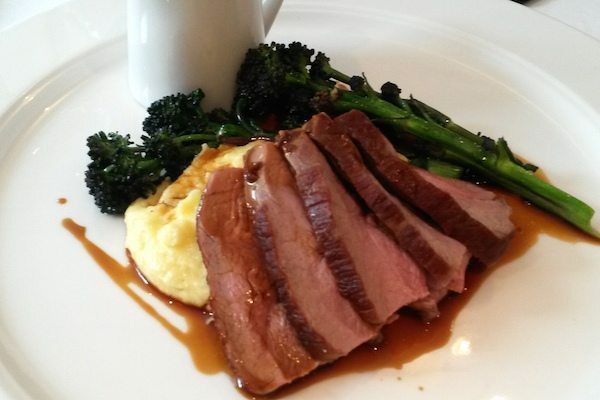 complimented with a creamy polenta and broccoli on the side all drizzled off with a rosemary sauce. It was incredibly good. I was glad I didn’t have to share with the vegetarian. The lamb was thickly sliced and moist, the polenta (not usually one of my favourites) was divine and the broccoli crunchy and fresh. The rosemary sauce dark and rich and treacly good, bringing it all together wonderfully well without making it too rich for lunch. Christabel was tucking serenely into a wonderful risotto of Wild Mushrooms, Pecorino and Roasted Baby Vegetables. 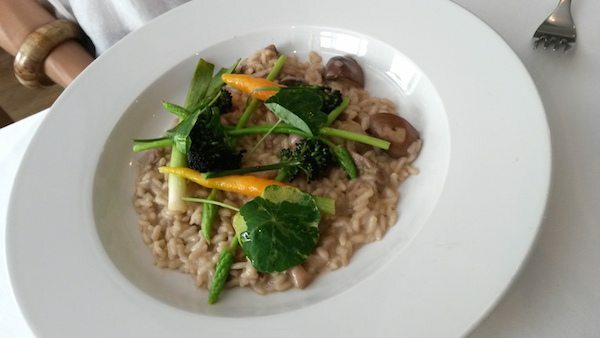 It was, again, a taste sensation – not at all heavy or claggy, it was savoury, creamy and dark with mushrooms – the spring veg fresh and crunchy and the rice al dente. There was just the right amount of sauce and we were oohing and aahing at both the skill of the chef and the quality of ingredients. The service was unobtrusive and yet friendly and welcoming. As we were both far too sensible to order dessert (and strapped for time, otherwise I would defo had gone for the brulee!) 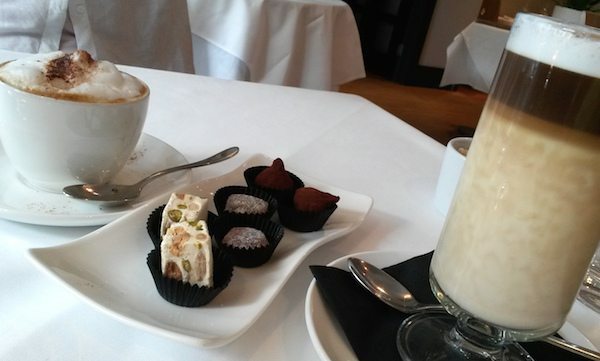 we just opted for the coffee and chocolates. They were AMAZING! 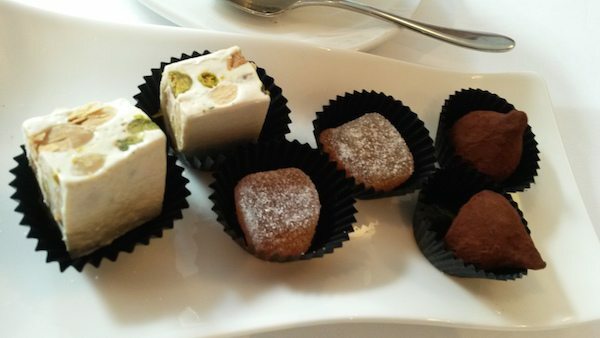 Please do try them, nougat, rosewater and ginger jellies and chocolate truffles. Drakes is notorious for their exceptional service and incredible food, now I see why. Thank you so much for having us, we really enjoyed our special lunch.